Proposition 6, the measure to roll back an increase in gasoline taxes, failed in California's midterm election. Projects that depended upon the tax increase, such as CalTrans' 30-30 program, will now have their funding stream restored. 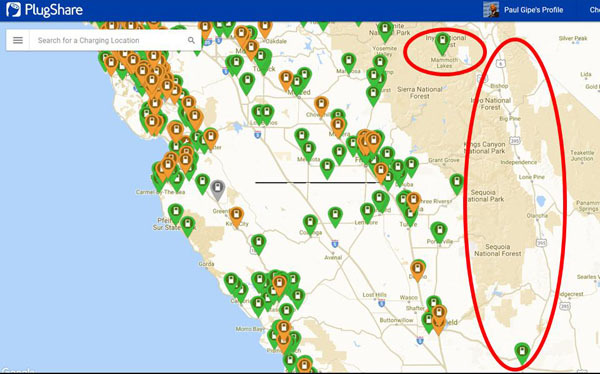 CalTrans 30-30 program was proposed by the Jerry Brown administration to install at least 30 DC fast-charge stations across California, often at roadside rest stops. Development of the stations has been delayed by Proposition 6. If Proposition 6 had passed, the stations would not be funded. Caltrans' District 9 serves the East Side of the Sierra Nevada. Currently there are no non-Tesla charge stations--neither DCFC nor Level 2 stations--on US 395 from Gardnerville, Nevada to Mojave, California, a distance of 330 miles. The resumption of funding for the program will be voted on in mid-March 2019 by the California Transportation Commission. Once the decision is made to resume the program, each project will be sent out to bid. Construction on the East Side is not expected before late summer 2019. Operation of the stations is unlikely to begin before year end. In its first report to California's Air Resources Board, Electrify America proposed at least three DCFC stations on US 395. There's no word on whether those stations are still part of Electrify America's plans or, if they are, when they might be installed.